If you’re tired of hunting for an antiperspirant that won’t let you down, it may be time to consider miraDry®. The expert providers at HK Dermatology offer miraDry underarm treatments to dramatically reduce underarm sweat and odor. A miraDry treatment makes it easy to experience the confidence of reliably dry underarms. Patients don’t need to suffer from excessive sweating to opt for miraDry, as many patients simply want to avoid the use of aluminum-based antiperspirants. To learn more, call the office in San Juan Capistrano, California, or book an appointment online today. 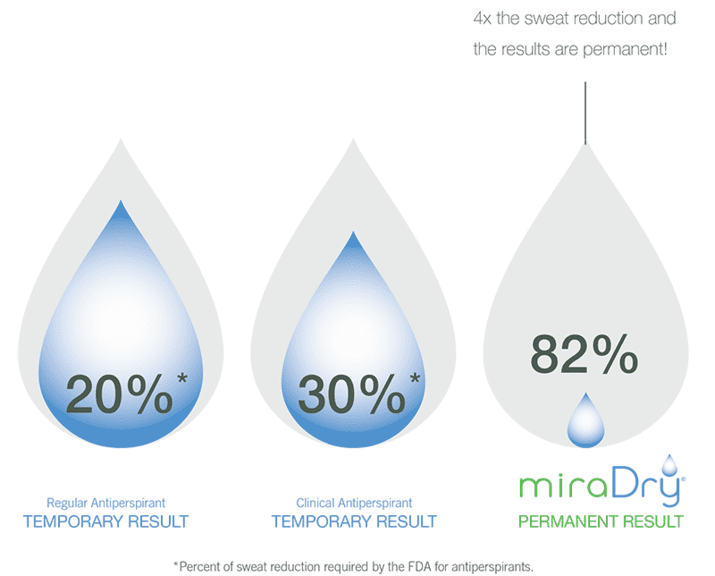 miraDry is the only FDA-cleared nonsurgical treatment that dramatically reduces underarm perspiration in only one appointment*. This revolutionary treatment uses heat energy to safely eliminate bothersome sweat and odor glands. Don’t worry — you continue to sweat after miraDry treatment, just not from your underarms. Your body contains 2-4 million sweat glands and only about 2% of those are located under your arms. Treating this small percentage of sweat glands doesn’t interfere with your body’s ability to regulate its temperature by sweating. Hyperhidrosis is a common condition that causes excessive sweating. This condition affects various parts of your body, including the underarms. Episodes of excessive sweating can be embarrassing and ruin your clothing. miraDry offers lasting relief from axillary (underarm) hyperhidrosis. After puberty, just about everyone is a good candidate for miraDry, but it can be life-changing for people who suffer from hyperhidrosis. If the fear of armpit sweat holds you back from raising your arms, whether it be to answer a question or celebrate a victory, miraDry may be right for you. miraDry permanently eliminates your sweat and odor glands. This provides long-lasting sweat and odor reduction without the chalky residue of failed deodorants. After miraDry treatment, you can feel free to wear whatever you want and confidently tackle your day without sweat stains or wet marks. With over 140,000 treatments worldwide, miraDry has an excellent safety record. This treatment is non-invasive, toxin-free, and cleared by the FDA to reduce underarm sweating. What should I expect from miraDry treatment? First, your provider at HK Dermatology performs a physical exam and reviews your medical history to make sure miraDry is right for you. During treatment, you relax in a reclined position for about one hour while your provider applies the miraDry handpiece to your underarms. They numb your underarms beforehand so you don’t feel anything. Treatment lasts approximately one hour and patients begin to see results almost immediately. Afterward, you can return to work or normal activities right away. However, you should hold off on exercise for a few days after treatment. It’s normal to experience mild tenderness, swelling, bruising, or tingling for several days after miraDry treatment. If you’re ready to ditch the deodorants and antiperspirants for good, call HK Dermatology or book an appointment online today.